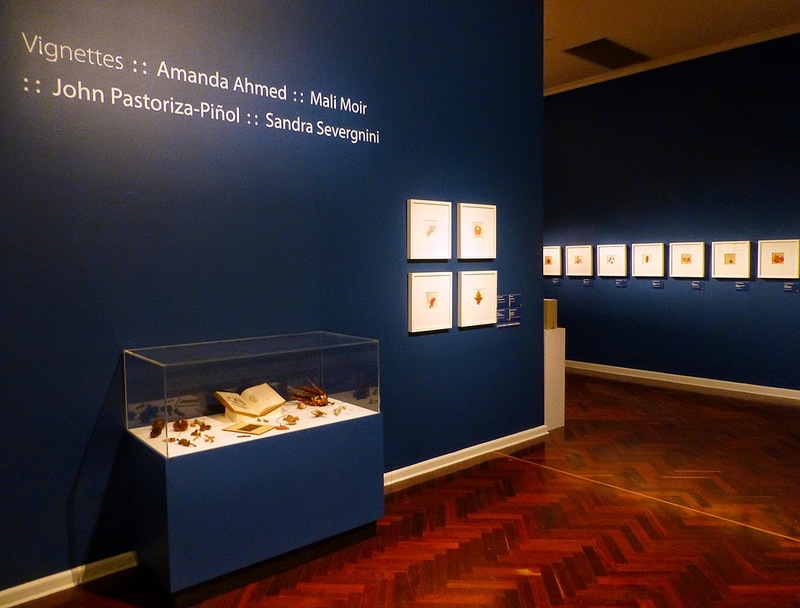 The exquisite attention to detail displayed by the four artists in Vignettes at the Art Gallery of Ballarat is nothing short of extraordinary. 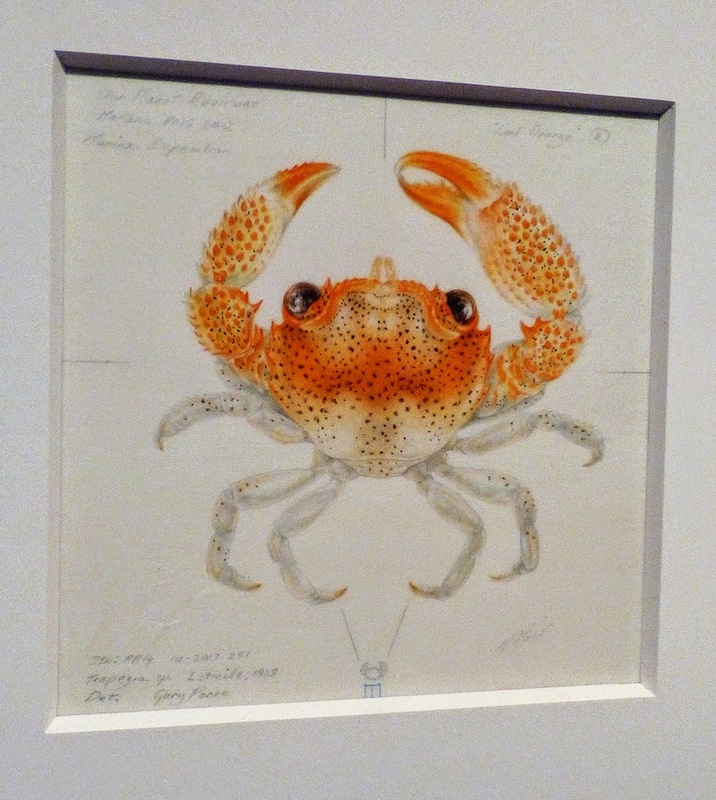 Their meticulous observation of their subject matter fits strongly within the tradition of natural history illustration, however these are more than merely beautifully crafted botanical or scientific studies. They move beyond a literal interpretation into more metaphysical territory, reflecting upon themes of fragility, transience, growth and decay. Amanda Ahmed’s ghostly leaf studies in graphite are tinged with melancholy. Deliberately off-centre, creating a certain dynamism between the subject and the negative space, and giving a sense of floating or falling. Her titles – Of Memory, Of Solitude, Of Anticipation – are inspired by the musings contained within Martin Farquhar Tupper’s Proverbial Philosophy, a book published in 1836 which once belonged to her great-great-grandfather. The humble, ubiquitous leaf, dried, twisted, and isolated from the tree whence it came, becomes a metaphor for the human condition and the transitory nature of perception. Mali Moir’s studies are more empirical. Arising directly from her participation in field expeditions to locations including Wilson’s Promontory, New Guinea, and the Australian desert, they transport us into the minute world of barnacles, crustaceans and seabirds. Working with pencil and watercolour on vellum, Moir adheres to a centuries-old tradition that is the very antithesis of high-resolution macro photography, and yet one could argue that it actually offers a greater immediacy and intimacy than the latter more instantaneous medium. The time and care taken to record a specimen with accuracy, the commitment to absolute verisimilitude, and the extraordinary ability to convey the delicacy of a subject matter that can only be properly observed under a magnifying lens offers us a privileged connection with the artist that a camera cannot possibly convey. John Pastoriza-Piñol also works on vellum, which brings a lushness and translucency to his fine watercolours. 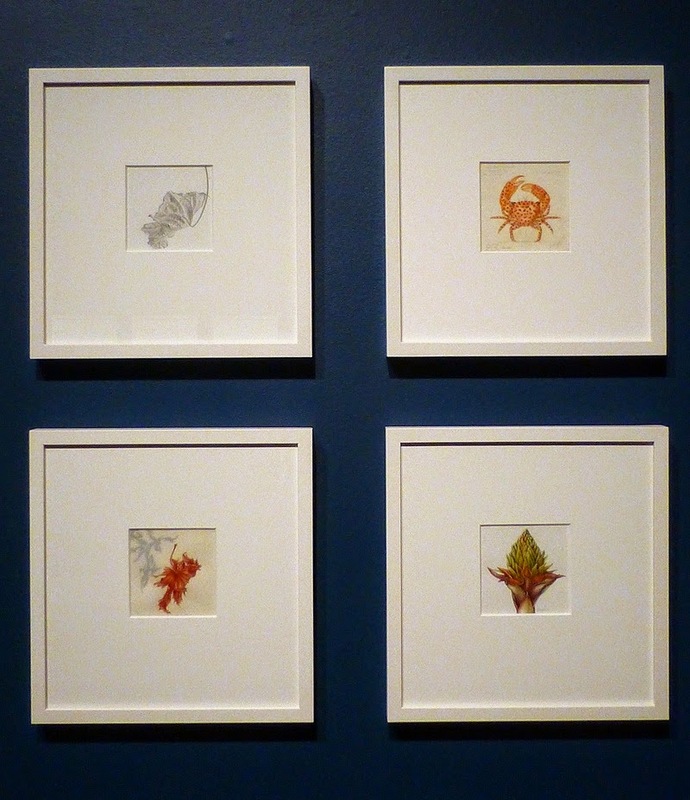 His work explores the delicate shift between permanence and impermanence, a juxtaposition of seemingly disparate elements: constructed social identity and botanical documentation. His portrays selected plants in their growth stages progressing from late summer to autumn, a time when that which has once bloomed radiant now slowly withers and fades, the shadows grow longer, and twilight comes sooner. 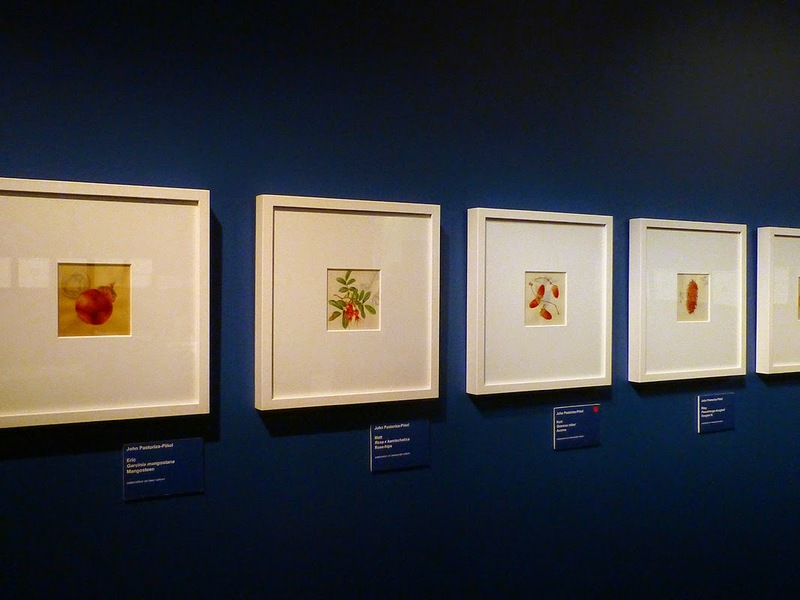 Emerging beneath the superbly painted botanical studies are images derived from tattoos, and the male names attached to the works give them a poignant intimacy, revealing a private symbolism, the significance of which is only known to the artist and the individuals to whom they refer. The age of the vellum itself plays a role, as the series begins with younger and smoother skin, and ends with more thickened, mottled skin, the clarity of the tattoos slowly diminishing until they can barely be seen at all. Finally, Sandra Severgnini’s watercolours focus on form and structure. Her compositions, somewhat unconventional in more traditional botanical art, convey a thorough understanding of nature’s complex architecture. But they also stimulate the other senses beyond the visual, the way things feel, smell and even taste – a walnut, dissected down to its lumpy, gnarled anatomy, has me anticipating the tasty harvest to come from my tree in another month or two. Texture and hardness, moisture and sweetness, fragility and decay are portrayed – another particular favourite of mine is Network, a delicate interweaving of spider’s eggs and bird excrement; an unlikely but perfect collaboration. The painstaking care that every artist displays extends beyond the artwork itself. Everything about Vignettes demonstrates a depth of thought and a clarity of vision – from the consistent size and number of the works from each artist, to the interrelatedness of the themes each one explores, to the design and layout of the exhibition (including the stunning wall colour!) It all combines to bring together one of the most cohesive and carefully considered group exhibitions I’ve seen in a long time. Stepping into the subdued light of the gallery with its dark blue walls is like being transported into another world; a quiet, secret, almost reverential space that invites contemplation and close-up examination of the work. One needs to spend time not only to appreciate the detail, but also to uncover the many layers of meaning that reside within. The exceptional skill and care take one back to a time before digital technology and the short attention span spawned by social media, it forces us to slow down and take joy in the extraordinary process that takes place between eye, hand, brush and page. Conceptual art, with its smugly obscure intent, and instagram with its special filters transforming everything mundane into an “artwork” appear clumsy and hopelessly amateur by comparison. It is heartening to know that there is still a place for “slow art”, and that patience, dedication and technical skill still exists.